Whenever I review a book, I try to look for a handle…a way in to talking about it. 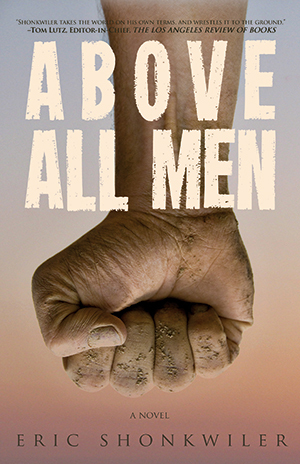 Some books are easier than others to get a handle on, but Above All Men by Eric Shonkwiler one suggested itself to me as I was reading. I kept thinking of Grapes of Wrath reimagined through the lens of The Road. Danvers leaned toward him. Name me one thing that’s broke down since the war that got fixed. You can’t do it. Can’t hardly get mail. Highways are all broke up, government won’t repair ’em. Eighty’s been more pothole than road for years. They say they’re getting things done but if you told me all the politicians was in some mansion laughin’ it up I wouldn’t be surprised. He sat back again and gestured toward the window. It’s all illusions. That’s what it is. You might as well wind the clock back a hundred years and call it 1930. Airplanes and spaceships. Your boy probably don’t know we had men on the moon. Might not belive you if you told him. It ain’t a bad thing, son. Where did all that get us? All that achievement, all that technology. Right here. Got us to right here. And that’s the only place we was ever gonna go. David drove south down the middle of the street as the red came on over the town, the creek consumed, sun blotted. It knuckled across the ground like an enormous fist, its bottom black and the top rearing far overhead. He pulled over short of the library and when he killed the engine the first wave of dust hit the windshield. There was a bundle on the sidewalk and in the thickening haze he made out shoes at the bottom. He opened the truck door and was stung and blinded, the door slamming behind him. The grit stuck in his teeth as he called to Samuel and the bundle moved. David pulled his shirt off and looped his free arm under the boy and put the collar of the shirt up against his mouth. He scooped Samuel under his arm and spun, the truck gone in the rust, and ran into the bed. He opened the door and dropped Samuel on the bench seat and climbed in after him. He lifted Samuel’s face to his and saw his eyes raw and colorless in the twilight. Samuel said nothing but clung to David and buried his face in his chest. David put his arms around him and peered out the windshield. The front of the truck had disappeared. Then the child of someone David tried to help is murdered. David is trapped between his wife’s desire that he stay out of it and focus on his family and his own need for justice. Whether from guilt over the terrible things he did as a soldier or his own ideals, or both, he can’t let go of trying to make the world be the kind of place it should be. I think it’s clear where my Grapes of Wrath/The Road comparison comes in here. It’s a new dustbowl, but of a horror magnified variety humanity has never had to face. The voice in the book is also plainspokenly honest like the Steinbeck classic, but Above All Men takes you darker places, places that belong more in The Road than in Grapes of Wrath. In short, we get to see how a very real seeming man tries to struggle forward for his family while torn between wanting to fight for what should be and accepting what actually is. The prose is stark, sparse, and honest, and it would be wise to pay attention. Above All Men may be a dystopian future…but it’s a little too close for comfort. Surprisingly little would need to happen before something like this could come about, things that could very well happen. You might want to start thinking about it. This entry was posted in Book Reviews and tagged Above All Men, MG Press. Bookmark the permalink.